Rip currents and rough surf, so what? Hazardous conditions are expected to continue along the Jersey Shore through the Labor Day Weekend. Do you know how to "break the grip" of a rip? All week, we've been discussing the elevated risk of dangerous rip currents, increased swell, and rough surf making for treacherous conditions along the Jersey Shore. Unfortunately, the danger may peak just as New Jersey prepares to celebrate the unofficial close of summer - the Labor Day Weekend. 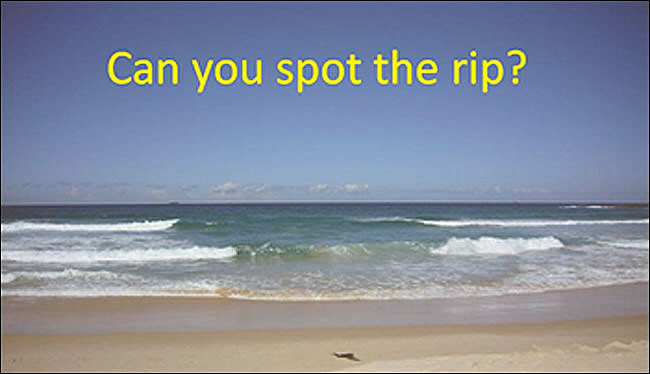 According to the American Meteorological Society Glossary of Meteorology, a rip current is defined as "a narrow current in the surf zone flowing seaward from the shore. It usually appears as a visible band of agitated water, caused by the return movement of water piled up on the shore by incoming waves and winds." 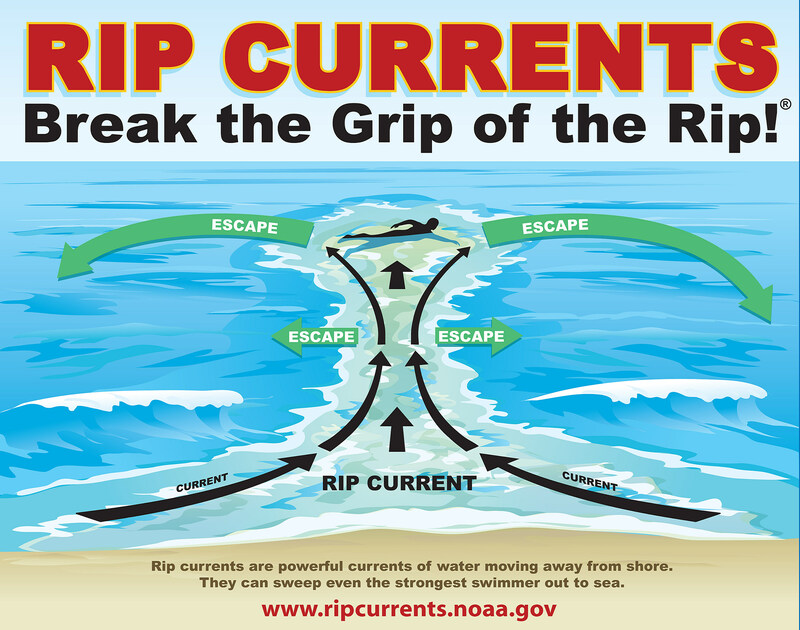 During the beach season (mid-May to mid-September), daily forecasts are issued, characterizing the risk for dangerous rip currents as Low, Moderate, or High. Remember that "low risk" does not mean "no risk" - dangerous surf conditions, including rip currents, may occur at any time, even when the ocean appears calm. --On-shore Flow: The usual culprit for rip currents. When a wind blows from the ocean toward the land, it produces strong wave action and surface currents that can rapidly and unexpectedly drag swimmers out to sea. The stronger the wind, the stronger and more frequent the rips. Common sense goes a long way in staying safe through rough surf conditions. Don't swim alone. Don't swim at night. And don't swim in rough surf if you're not a strong swimmer. Fortunately, when it comes to particularly fierce waves and rough seas, New Jersey's lifeguards and town officials play it safer than in the movie Jaws. If the water is not safe, they will not hesitate to post red flags. Even on a holiday weekend. "In terms of safety, follow the advice of local lifeguards who will be observing the waves and swimmers. There may be some beach closures, all dependent on the reality that develops. This is not a time to swim on your own without lifeguard presence. Additionally, waders are cautioned not to turn their backs to the waves when coming out of the water. Wave knock down can result in upper torso injury (dislocations/spinal cord injuries)." --Don't fight the current. It's a natural treadmill that travels an average speed of 1-2 feet per second, but has been measured as fast as 8 feet per second—faster than an Olympic swimmer. --Relax and float to conserve energy. Staying calm may save your life. --Do NOT try to swim directly into to shore. Swim parallel to the shoreline until you escape the current's pull. When free from the pull of the current, swim at an angle away from the current toward shore. Be smart. Be safe. And keep checking with us for your latest Get to the Beach Report for the Jersey Shore! Source: Rip Currents and Rough Surf, So What?